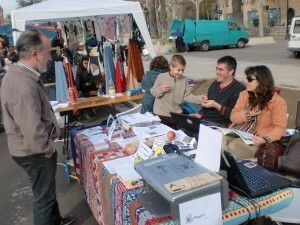 Last Sunday we decided to “turn real” and opened our own small street market shop, along with many other open initiatives, at the 2nd Barcelona Exchange Fair organized by Ecoxarxa. 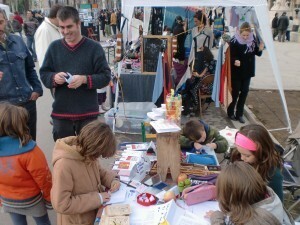 We explained the pliegOs concept to many people and distributed free digital DIY samples, sold more than 30 copies of pliegos for/by kids (from the Panxa del Bou collection, soon to be published here too) that costed 1 Eco each (the local currency that day, 1 euro at change). 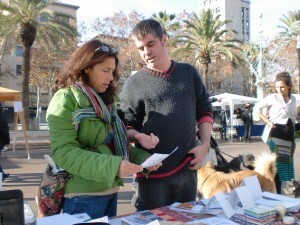 We also managed to test some methods for what hopefully soon would be our first workshops at schools, with kids being at the same writers, illustrators, editors and printers of their own books!